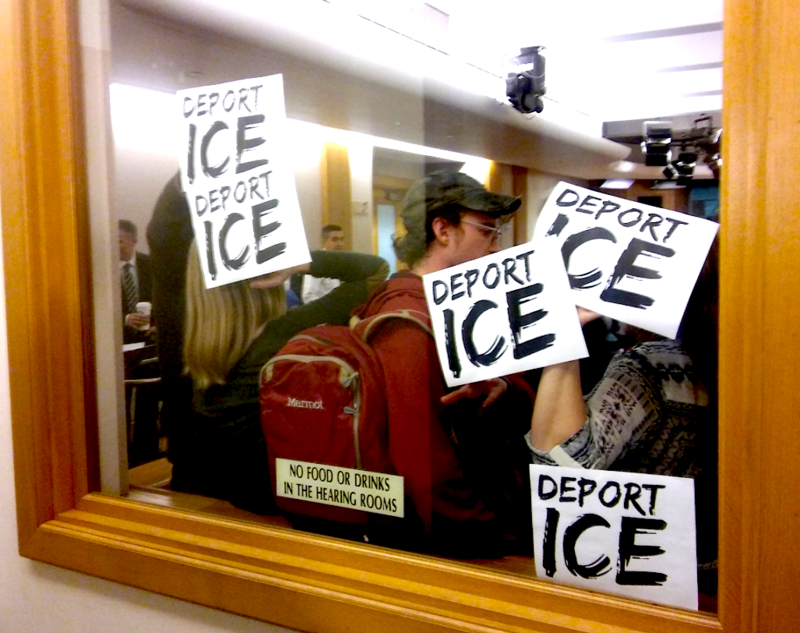 Activists at last week's Oakland public safety committee meeting demanding the city sever all ties to ICE. A police misconduct investigation targeting Oakland's police chief took another turn last night after a group of citizens said they have "little confidence" in the Citizens Police Review Board investigator who is handling the case. Oakland Privacy Commission Chair Brian Hofer and several city residents filed the original complaint against Police Chief Anne Kirkpatrick for making false statements about an Immigration and Customs Enforcement raid last August. Kirkpatrick had assigned three police officers to assist ICE during the raid. The officers blocked the street to through traffic and were seen communicating with ICE agents who carried out a search warrant. Kirkpatrick has defended her decision to assist ICE saying that she was told by ICE Special Agent in Charge Ryan Spradlin that the operation was part of a criminal investigation into human trafficking, not a civil immigration action. She also has stated that her intention was to provide a buffer between the public and the ICE agents during the raid, especially because it could have resulted in a gunfight. And Kirkpatrick has also said publicly that she never violated Oakland's sanctuary ordinance and has every intention of following policies established by the mayor and city council. But the only person who was arrested during the August ICE raid was never charged with a crime. Instead, federal officials moved to have the man deported due to a violation of civil immigration law. It's also unclear if the raid was in fact part of a criminal investigation. ICE has so far refused to release any documents about their investigation. Kirkpatrick made several public statements after the raid that it raid was a criminal law enforcement operation, and that a criminal case was filed against the man who was arrested. Under Oakland law, city employees, including police officers, cannot assist federal agents in the enforcement of civil immigration law. Hofer and several other Oakland residents accused Kirkpatrick of making untruthful statements and filed their complaint with the Citizens Police Review Board and OPD's internal affairs unit on Nov. 6. Now, the complainants say the city investigator assigned to the case is mishandling it, and that the investigator even inquired about people's immigration status. In a letter to Citizens Police Review Board Executive Director Anthony Finnell, Hofer and a dozen other Oakland residents, wrote that investigator Joan Saupe conducted a 20-minute interview with Hofer during which Saupe made "improper" attempts to determine the legal status of the family whose home was targeted by the August ICE raid. "Ms. Suape was attempting to establish the criminal predicate that ICE says exists, that the family is guilty of human trafficking," they wrote. They added that the investigator "asked Mr. Hofer how the family entered into the country." Hofer and the other authors of the letter requested that Finnell replace Saupe. They said the family's immigration status has nothing to do with the complaint, which focuses instead on Kirkpatrick's claims that ICE was conducting a criminal investigation. Finnell didn't respond to an email from the Express seeking comment about the letter. At last night's city council meeting, Hofer disclosed sending the letter to Finnell. He also said the issue of OPD's possible collaboration with ICE is all the more relevant following the recent news that ICE plans to conduct a sweep of the Bay Area, specifically targeting sanctuary jurisdictions. Another result of the August ICE raid was a resolution restating the city's sanctuary policy and specifically barring OPD from providing any assistance to ICE, including traffic control. Councilmember Rebecca Kaplan, who drafted the resolution, called OPD's assistance of ICE during the august raid "inappropriate." The council passed the resolution unanimously last night (Mayor Libby Schaaf also previously told the Express that she, too, supported the resolution). The resolution included an amendment from Councilmember Abel Guillen directing city staff to bring it back as a full ordinance within 60 days.